The Ontario Immigrant Nominee Program (OINP) re-opened its investor immigrant program on December 18, 2015. The renamed program now has two new streams rather than the previous Investor stream. Have a minimum of 36 months (3 years) full-time business experience in the last 60 months (5 years), with the last 12 months (1 year) in the area of general business experience, or a particular expertise related to the business opportunity you plan to pursue in Ontario. Your listed business experience must be as a business owner, OR as a senior manager. If you have experience both as an owner and as a senior manager, choose only ONE of the two to list on your Expression of Interest, EOI. Have a minimum net worth of CAD$1,500,000 if your business is to be located within the Greater Toronto Area (GTA). Have a minimum net worth of CAD$800,000 if your business is to be located outside the Greater Toronto Area (GTA). Have a minimum net worth of CAD$800,000 if your business is to be in the Information & Communications Technology (ICT) sector or the Digital Communications Sector, regardless of where in Ontario it is to be located. You must make a personal investment in your proposed business of CAD$1,000,000 if your business is to be located within the GTA. You must make a personal investment in your proposed business of CAD$500,000 if your business is to be located outside the GTA. You must make a personal investment in your proposed business of CAD$ 500,000 if your business is in the ICT/Digital Communications Sector, regardless of where in Ontario it is to be located. In all cases, you must have a minimum equity ownership of 33.3% in your proposed business. You must commit to create at least 2 permanent, full-time jobs for Canadian citizens or permanent residents. If you are purchasing an existing business, you must create 2 additional permanent, full-time jobs, for Canadian citizens or permanent residents. If you will be purchasing an existing business, you must make at least one exploratory visit to Ontario for business purposes, within the 12 months prior to your submitting your application. If you are applying with a business partner who is also seeking nomination, they must meet all the above minimum requirements. That means your shared proposed business would require double the amounts invested listed above, and would have to create a minimum of 4 full-time permanent jobs. It must be a profit-driven enterprise, by delivering goods or services. It must derive its revenue from active or earned income – not passive income. It must comply with Ontario’s and Canada’s laws and regulations in health and safety as well as with labour regulations. It must only have third-party investors (if any) who are Schedule I or Schedule II financial institutions. These are domestic or foreign chartered banks, authorized to operate in Canada under the Bank Act. It must be considered a permanent business in Ontario: one with a fixed address in Ontario; no end-date; and liable for tax on profit earned. It must have been in continuous operation for at least the past 60 months with the same owner(s). Ownership must be completely transferred to you, and any business partner or third-party investors (if applicable). The original owners from which you are to purchase their business can NOT have been or be OINP business immigrant investors. You must preserve all existing full-time permanent jobs AND create at least 2 additional full-time permanent jobs. Current wage levels and employment terms of existing employees must be at least maintained if not improved. You must have a Business Plan that shows you intend to grow the business. You must physically reside in Ontario for 9 months out of each year (75% of the time) while establishing your business. Businesses previously owned by current/former OINP business stream nominees. If you are interested in learning about the Corporate Stream, please let us know by contacting us or commenting below. Prior to submitting an Expression of Interest (EOI) you should first ensure that your proposed business is not on the ineligible lists above and that it will conform to all the applicable regulations and laws of Ontario and Canada. For this reason, and especially when you are considering purchasing an existing business, you should consider an exploratory visit to the province of Ontario. Your visit must be within the 12 months previous to your submitting an application. An Expression of Interest, or EOI, is your first step in the actual process of applying. An EOI, however, is not your application. It is an expression of interest on your part in the OINP Entrepreneur stream. Think of it as similar to completing an Express Entry profile and being placed in a pool of candidates. The EOI is a self-declared points-based system where your score will determine the likelihood of your being invited to apply. You will have to support any claims/information you provide when completing your EOI with underlying documentation. As well, the information you provide in your EOI will be the basis of your contractual obligations when you sign a Performance Agreement in Step 5. If, for example, you state in your EOI that you will invest CAD$2,000,000 in your proposed business, then you must – by contractual obligation via your Performance Agreement – be able to invest that amount when you arrive in Canada and establish or purchase your proposed business. If you are unable to, or if any other information in your EOI is inaccurate or misleading, your application may be cancelled. You must either provide your experience as an owner or as a senior manager, but NOT both. Supporting Documentation: Financial Statements, Reference Letters from investors, financial institutions, suppliers, vendors, customers. Supporting Documentation: Organizational charts detailing your position & reporting structure, Official employer reference letters detailing your position, reporting structure, role, length of employment. Supporting Documentation: financial statements, letters of credit, export permits, reference letters from employer in case of senior managers etc. Please note that Specific Experience is not a mandatory requirement, but you must provide supporting documentation in order to support the points claimed in your EOI. Your personal net worth is defined as all your assets including those of your spouse or common-law partner, less any liabilities including mortgages and personal debts. If you receive an Invitation to Apply, you will have to contract a Designated Service Provider from a list given to you by the OINP, in order to review your personal net worth. You will have to provide any requested supporting documentation to back up your claims. Remember the investment amount you provide in your EOI will be a contractual legally binding obligation, used in your Performance Agreement (see below). You will have to provide evidence that your investment was allocated in full: bank and financial statements, invoices, etc. Purchase of existing business assets – including inventory – and purchase of business equity. New inventory related to business expansion or improvement plan. When purchasing a new business; you must allocate some funds towards the improvement and/or expansion of the business. Please note that signing a letter of intent or an agreement to purchase a business BEFORE you receive an Invitation to Apply and BEFORE your application is approved, is solely at your own risk. If you do so, OINP will accept investments that are made within 1 year of your application date. Finally, all the requirements must be fulfilled completely by BOTH you and your business partner, should you have a business partner. Employees who do not work on the company premises. If you will be purchasing an existing business, you must create 2 additional full-time positions. If your business targets a key sector you can claim 10 points. This is not a mandatory requirement. You will be required to provide evidence of your education in the form of an Educational Credential Assessment, or ECA. If you receive an Invitation to Apply, you will be required to provide proof of your Official Language Ability through either IELTS or TEF (French). You will be required to have achieved a CLB (Canadian Languages Benchmark) level 5 by the time you are nominated, that is, after you meet your Performance Agreement goals. Remember to include both you and your business partner’s – if you have one – printed copy of the self-assessment report and a printed copy of the completed EOI form. As well, you do NOT need to provide any supporting documentation when you complete and submit your Expression of Interest or EOI. You will need to provide supporting documentation later, if and when you are invited to apply and receive an Invitation to Apply. OINP will send you an email confirming receipt of your EOI, and from the date of the confirmation email, your EOI will be entered into a selection pool for a period of 12 months. If you receive a Not Eligible classification on any of the minimum requirements (see above) you will not be placed in a selection pool. If you wish to withdraw your EOI, you must notify the OINP by email. Include your name, the name of your business partner (if applicable) and the date your EOI was submitted. Draws from the pools will be held approximately every 120 days (4 months). Visit the OINP website for more information on draw dates. If you are selected to apply you will receive an email from OINP informing you of your Invitation to Apply, along with a list of the documents you (and your business partner if applicable) must submit with your application. Notaries in good standing with the Chambre des Notaires du Quebec. If invited to apply, you will need to hire a Designated Service Provider – usually a private sector accounting firm – form a list provide to you by the OINP to review your personal net worth. They will review any requested documents and may do an independent investigation to determine that your net worth is valid and has been obtained legally. Your DSP will send you a copy of the verification report which you must send along with your application. The DSP is required to complete the review within 60 days. You are responsible for any and all charges associated with producing the verification report. A standard range for the report is between CAD$3,000 and $5,000. Any documents not in English or French must be accompanied by a certified translation. If you are applying from within Ontario, the translator should be certified by the ATIO. If applying from outside Canada, you may use any third-party translator, but your documents to be translated must be notarized in such a case. You may be asked to attend an in-person interview at the OINP offices to further understand your business plan. As with any other associated expense, you are responsible for paying all travel and other costs associated with a visit to Ontario to participate in the interview. If you are unable to attend the interview, your application may be denied. If you wish to withdraw your application, you must contact the OINP. Your application processing fee will NOT be refunded. If your application is accepted, you must sign a Performance Agreement, which outline the commitments required in order to be nominated for permanent resident status. If you fail to meet your commitments you will not be eligible for a nomination for permanent residence. 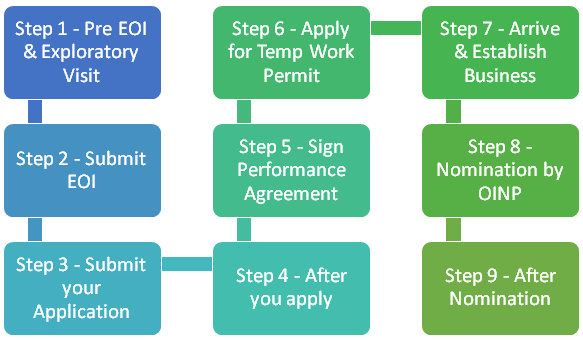 Once you have signed your Performance Agreement, the OINP will issue you a Letter of Confirmation so that you can apply to IRCC (former CIC) for a temporary work permit. You must apply yourself, with the Letter of Confirmation to IRCC (Immigration, Refugees, & Citizenship Canada) for your Temporary Work Permit as soon as possible. Without the Temporary Work Permit you will not be able to enter Canada and establish your business. Please note that the OINP can withdraw their support for your temporary work permit should you at some point no longer meet the eligibility criteria. You must arrive in Canada within 12 months of the date of your Letter of Confirmation with your valid Temporary Work Permit. And you must inform the OINP of your arrival in Canada within 7 days of the date of your arrival. You must, however, have created the required number of full-time jobs within 10 months of having arrived in Canada. OINP officials will monitor your business and may visit the premises from time to time. You must submit a Final Report to the OINP between 18 and 20 months from your arrival in Canada, along with any required supporting documentation. The OINP will provide you with a template for your final report. You must show you have met your Performance Agreement Commitments in your Final Report. Ontario Immigrant Nominee Program Confirmation of Nomination document. You must then apply to the IRCC for permanent residence status, within 6 months of being nominated. Include a copy of the above 2 documents along with whatever other documentation the IRCC requests. The final decision on your application for permanent residence will be made by the IRCC, not the OINP. Post-nomination monitoring of your business by OINP officials will continue for 36 months after you attain permanent residence status.